In tarot, the Hanged Man usually represents suspension or indecision rather than a form of punishment, his painful-looking predicament notwithstanding. Just look at his expression; it’s almost serene. Such a timeout can be one of restoration, reflection, or just plain purgatory, depending on how it’s spent and whether it’s self-imposed. Ted Leo didn’t quite go into hiding in between 2010’s The Brutalist Bricks and his new The Hanged Man. 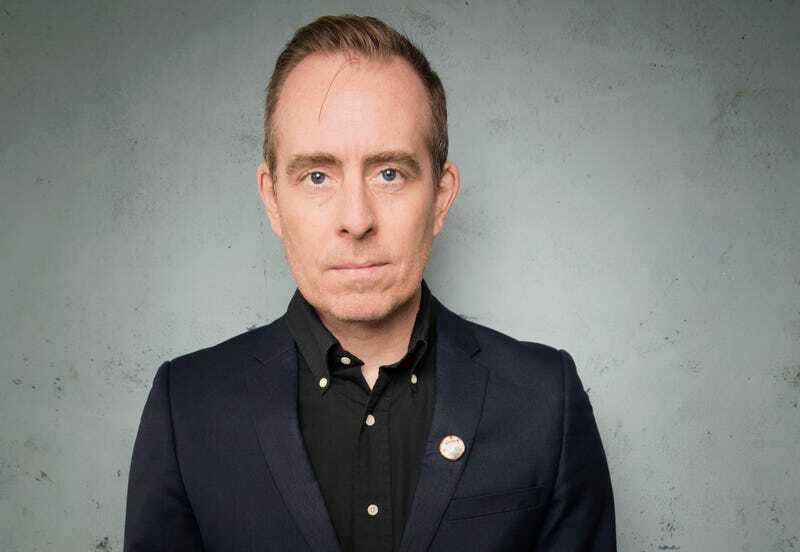 But thanks to his prolificacy, the absence of a proper Ted Leo record in that time seems especially glaring—even if the Pharmacists frontman did release a solid one with Aimee Mann as part of The Both in 2014. Leo’s DIY work ethic didn’t abate, though, not even after he and The Pharmacists parted ways with Matador. He continued to write and record songs on his own, amassing a catalog that he’s only now divvying up into albums. The Hanged Man is the result of that hiatus and more, a whole hour of tracks imbued with his reliably eloquent fury, as well as turns more mournful than we’ve ever heard from him. Leo plays with his familiar pop-punk sounds on songs like “Can’t Go Back,” doubling down on their catchiness with girl-group backup vocals. 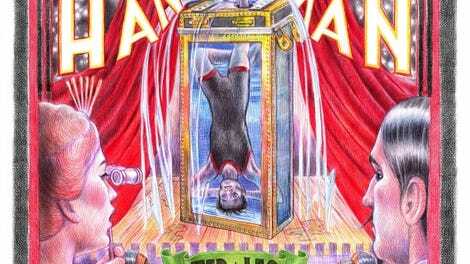 In addition to that detour to Motown, The Hanged Man also harks back to the British Invasion by taking inspiration from The Beatles on “Gray Havens,” a song that grows more complex as it goes on, with a drum machine interrupting the exquisite string arrangements just as you’re getting your head around it. These sonic intrusions are few and far between, and just playful enough to smooth over the rougher edges on the album Leo recorded and released on his own (with the help of a fully funded Kickstarter campaign). Leo’s an exceptional songwriter, and his passionate vocals have always been more than competent. But while he obviously knows the ins and outs of song-craft, his production on The Hanged Man leaves something to be desired. “Anthems Of None” comes blaring late into the second half, but its rousing chorus is almost drowned out by the driving guitar and bass lines. This isn’t a real sticking point, though; the instrumentation still makes it impossible to remain in your seat. “You’re Like Me” is firmly in Leo’s wheelhouse, but it’s a more successful deployment of his chops on both sides of the sound booth, with Leo’s lyrics grasping for common ground that sometimes turns out to be quicksand. The Hanged Man was underway in some form long before the Trump presidency, but it still feels as achingly pertinent as Shake The Sheets, Leo’s savaging of (and coping with) the Dubya era. In times of trouble, some people look to hosts of satirical news shows for comfort; others hope for galvanizing jams. Leo obviously wants to deliver on that front, but he’s also reckoning with personal tragedies. On the somber album closer, “Let’s Stay On The Moon,” he touches on his wife’s miscarriage, a rare and painful reveal that would more than justify his withdrawal from the public eye. “Lonsdale Avenue” is in the same vein, and no less gut-wrenching. The states of flux and inaction symbolized by the cover art are reflected elsewhere on the album, including “The Little Smug Supper Club” and “Run To The City.” The former describes a liberal echo chamber, while the latter is about gentrification and white flight, reflecting a personal push and pull for the singer who’s retreated to New England after being priced out of his beloved New York. These are limbos of their own: The left-leaning diners of the “Supper Club” grow complacent and inattentive, while giving up big-city living can feel like being in exile. But in both cases, they’re just temporary states. This seven-year stretch has obviously been both reinvigorating and emotionally devastating for Leo. Fortunately, he’s channeled all that grief, anger, and inspiration into another 14 tracks packed with commentary and experimentation. Like the man in the tarot, Leo appeared to be on the ropes, but it turns out he was just in repose. Purchasing The Hanged Man via Amazon helps support The A.V. Club.